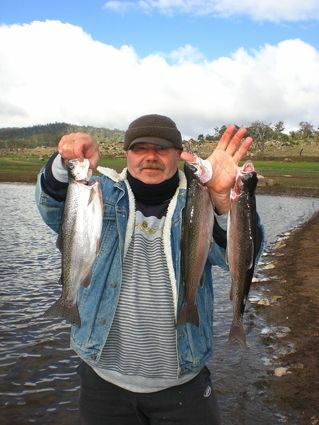 Fishing has continued to be excellent on fly in the lake Eucumbene with heaps of fish about and some good quality. The lake has dropped less this week too, hopefully it may steady off soon. Bait fishing in the lakes has been excellent. Rivers:- Are fishing very well at present with a good top up last weekend. No reports of any browns running with the rain, most likely it is still a little early yet though you never know it might spur a few fish into the rivers anyway. With good weather this weekend would be a fantastic time to hit the streams and search out some of the great browns that reside in them. A good case in point is myself fishing in the Rushy Plains area catching three on mudeye patterns with the fish having very little in the way of mudeye in them, while over at Buckenderra, on the same night, Ken Cain landed eight fish with one of the rainbows having sixty mudeyes in its stomach! 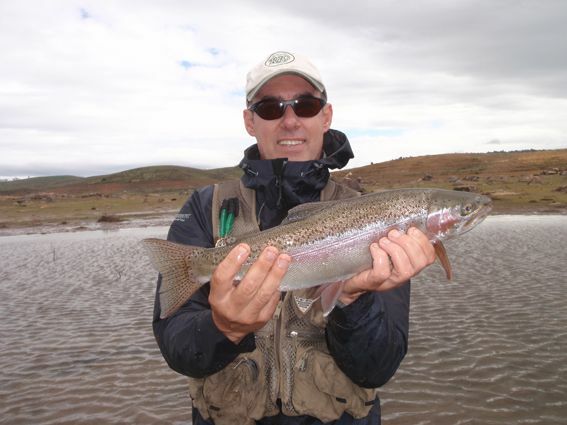 "There are plenty of Rainbow Trout around and Fly Fisherman are doing really well. They're catching fish on Green Bead Heads, Green Woolly Buggers, Green Nymphs and Tom Jones Flies. Bank fishing is good, fishing well close to the bank"
Matt and I had a good morning on Monday fishing Lake Euc despite some pretty ordinary weather. Some good heavy rainfall over the weekend and then heavy rain north of Cooma had us a little worried as did the gusty North Westerly wind but we managed to find some clear, castable water around Frying Pan. In a short session from 8 until about 11 we hooked half a dozen fish landing 5. All were nice rainbows in great condition in the 1.5-3.5 pound range. Spinning off the bank has been good with Mario from Angler's Reach doing very well in windy conditions on his Snowy Minnow. Best fish last week was a five pund brown. I fished eucs Friday morning on the troll before work. Not the best conditions however. Three fish, all bows on three colours of lead line . At Braemar Dam wall ramp is the best bet for launching. This is my son, Eligh Unwin who is 8 years old from Queanbeyan. 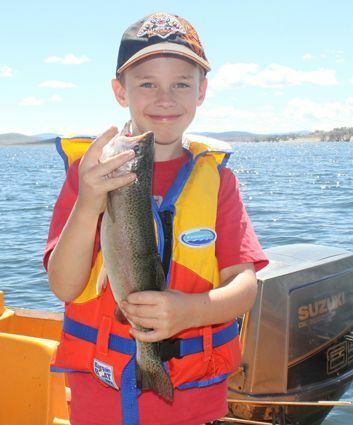 This was his 1st trip to Lake Eucumbene where he caught his 1st Trout. All up he caught 4 fish and went home a very proud fisherman.........he has now caught the fishing bug!!! *Mick and his son Matty fished the Seven Gates area for nine rainbows over the weekend. Green powerbait and mudeyes were the pick of the baits. *Alan Hocking and John Nowak had a good night and morning session last night and today with a total of five fish each. They were fishing in the Middilingbank arm out of Buckenderra and Lemon Twist and Orange Pulp powerbait and gulp were the go.